Practice developing an even, cadenced lope away from the poles. 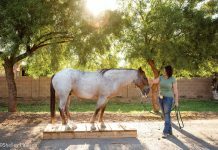 Make sure your cues are clear and your horse is listening before working on lope-overs. Practice over poles and away from them. Keep an even, motivated pace throughout the course. Keep your focus ahead on where you want to go next. Walk the course beforehand whenever the show allows. Don’t allow yourself to get thrown forward in the saddle over elevated poles. 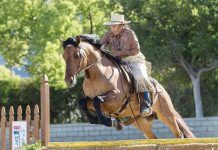 Don’t get too slow—momentum is necessary for the horse to make the distance between poles. Don’t look down at the ground. Don’t look at the poles themselves as you’re negotiating the lope-over. Don’t speed up or slow down as you approach a lope-over.